The Royal Geelong Yacht Club (RGYC) has been crowned Victoria’s best after winning not one – but two major categories at the annual Victorian Sailing Awards. The Club took out the prestigious major prize of ‘Yacht Club of the Year’ and the RGYC’s sailing school was also crowned the best in the State, winning the 2017 ‘Discover Sailing’ Centre of the Year. The awards, which were announced at the Victorian Sailing Awards held at Sandringham Yacht Club on Sunday, June 18, recognised the Geelong club as being the best of 90 yacht clubs right across Victoria and the sailing school as the best of 40 Discover Sailing centres. Yachting Victoria President, Cherry Birch presented the awards which noted that RGYC as Club of the Year had attracted more than 4000 competitors over a broad series of championships and events – including the historic Festival of Sails – while the RGYC Discover Sailing Centre had demonstrated ‘outstanding growth’ over the past three seasons. RGYC’s Commodore, Chris Williams said the club was delighted with both wins. “To be recognized by your peers and fellow yachting enthusiasts as a club that stands out above all others is high praise and I know all of our members will be very proud of that accolade,” he said. “It is a credit to all our Members, volunteers and our staff. “Sailing is a wonderful sport and we’ve really concentrated on trying to get more people of all ages to come and give it a go. 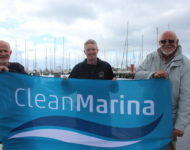 Mr Williams said the club had also worked hard to address the perception of sailing being a male only sport by introducing four new women’s programs this year which have been enthusiastically received. According to RGYC’s Sailing Academy Coordinator, Chris Jones, feedback about the sailing training is overwhelmingly positive and retention rates are strong, with 50 per cent of students retained from course to course. “We recognised that we had an issue in the past trying to get kids up to the age of 12 who’d been involved with the Tackers program to continue through as they got older,” he said. “But we’ve now been able to simplify the transition from Tackers to the next level Green Fleet program by creating a cost effective bundle that puts club membership, tuition, race fees and boat hire all together. Commodore Chris Williams said the commendation for RGYC’s Discover Sailing program was even more appreciated because the entire crew of more than 25 instructors were all young RGYC members who had completed the training themselves. “Our young sailors not only appreciate the training they’ve received with us, but also want to contribute to their sport and our club,” he said. Being awarded ‘Yacht Club of the Year’ was also a timely affirmation of the Royal Geelong Yacht Club’s exciting growth plans, according to Mr Williams.